22 - Where are they? 25 - What are they like? 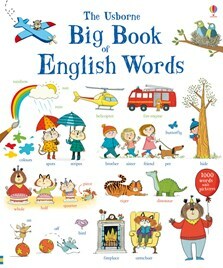 A colourful picture word book with illustrations of around a thousand everyday words. Words are arranged by theme, providing lots to spot and talk about together. A fun way to build a child’s vocabulary, with delightful pictures to pore over. Listen to all the words read by a British English speaker at the Usborne Quicklinks website.